The Borg arrive in Federation space and take an unusual interest in the Enterprise and Captain Picard. The final episode of the third season is arguably the most important. "The Best of Both Worlds" is the show putting all its cards on the table, thrusting forward with bold confidence. Everything about this episode--the music, the writing, the visual effects, the acting, the cinematography (I love the dutch angles)--is polished and professional, and it isn't shy about doing what it wants to do. TNG has been building to an episode like this, an episode that combines both the new mythology, as epitomized by the Borg, and an emphasis on dynamic character arcs, as demonstrated by the show's laser-like focus on why Riker hasn't moved forward. By closing with a season-ending cliffhanger--something a Star Trek show had never done before--they are delivering a crystal clear message to the audience that this is the kind of storytelling we have to look forward to in the future, and we'd better get used to it. I remember when this first aired. It was beyond epic, and the rumors were rampant that Patrick Stewart (the actor who plays Picard) hadn't signed on for a fourth season and that he was essentially being killed off. It sure seems inevitable in the cliffhanger that Picard can't possibly survive and that everything has been building to put Riker in command, with Commander Shelby as the new First Officer. There's a really awesome reason for that, too; the writer of this episode, Michael Piller, didn't think he'd be returning to the show for the fourth season, and he had no plan whatsoever for how this story would resolve itself in the inevitable sequel. For that reason, he deliberately painted the story into a corner, trying to give whomever would have to follow it up an unbeatable challenge. The awesome part is that Piller did wind up coming back for the fourth season, and his first assignment was writing "The Best of Both Worlds, Part II." Still, what Piller and TNG managed to accomplish shouldn't be underestimated. For the first time, the stakes on the show get so high and so intense that people seriously believed that Captain Picard was leaving the show. Back in the first season's "Skin of Evil," the show proves it is willing and able to kill off a main character, something the original series never did, and with "Conspiracy," just a few episodes later, it shows that it wants to up the ante by putting all of Starfleet in danger. Here, in "The Best of Both Worlds," there are characters openly discussing the possibility that the human race is about to go extinct, that there is no conceivable way for this to end well. The first time we meet the Borg, in "Q Who," it is made abundantly clear that the Enterprise is no match for them, but with Q in the mix, there is at least a safety net. Here, the Borg is heading directly for Earth, but there's no Q and no indication that this is happening in an alternate timeline or reality, common conceits in Star Trek that offer no solace against this threat. Similarly, the situation Riker is put in doesn't seem to have an easy out. Even Picard tells Riker to move on, to accept command, and Riker can't quite express any reason to stay on the Enterprise. Commander Shelby comes along to demonstrate how far he's come, and his reaction to her only serves to prove that he's too comfortable. He's already passed up two commands, just like Wesley's missed two opportunities to enter Starfleet Academy, and it would take something truly compelling to explain why he'd do it again. This is a surprisingly deep exploration of Riker's character, and one that I find a lot more poignant through adult eyes. I would be remiss if I didn't discuss the evolution of the Borg here. What makes them terrifying is maintained and made abundantly clear in the exchange between them and Picard, when Picard explains that humanity is built on freedom and that people would rather die than serve the Borg, to which the Borg reply that freedom and death are irrelevant. Still, I'm not sure I understand why they conclude that they need a human authority figure to smooth the transition; it doesn't really make much sense, even though it leads to the most shocking moment of the episode: the assimilation of Picard. 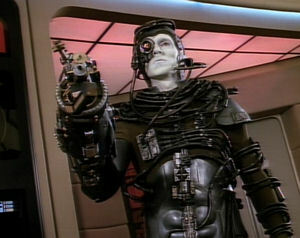 This is the first time we see somebody assimilated like that, and it's a great way to make the Borg even more terrifying. As a side note, as I was rewatching this episode, I found myself wondering for the first time why the Borg lumber like zombies. What good is all that cybernetic enhancement if it doesn't make them fast? Number of episodes in which a member of the crew is subverted by an alien influence: 9. Assimilation is the ultimate form of subversion. When the Borg threaten to destroy the Enterprise if the captain doesn't beam over, it reminds me of 2009's Star Trek, when Nero does the same thing. It's interesting that, in this instance, Picard doesn't even appear to contemplate turning himself over. Best episodes: "Yesterday's Enterprise," "Sins of the Father," and "Best of Both Worlds." Worst episode: "Ménage à Troi." The difference in quality from the second season to the third is startling. Rewatching the show in order like this has made that very clear. If the first season was about separating TNG from TOS and the second season was about finding a unique voice, the third season is about embracing the characters and forging more organic storytelling possibilities. With episodes like "Sins of the Father" and "The Best of Both Worlds," we finally have the characters taking on a life of their own that surpasses the confines of a single story. Going into the fourth season, we have dangling plot threads, characters in flux, and an enormous cliffhanger that demands resolution. TNG has entered adulthood at last.